New year wishes to all of you..I hope you all had a wonderful start to the new year. 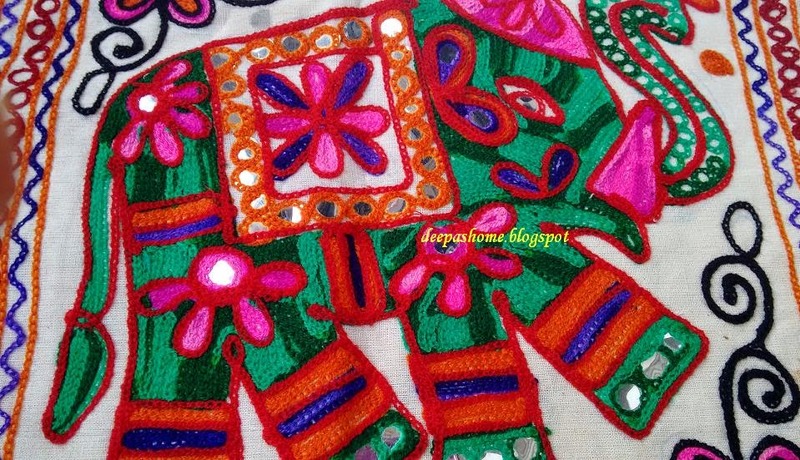 2015 started on a colorful note with my sis-in-law getting an embroidered bedlinen for me from her home state.Here it is.. 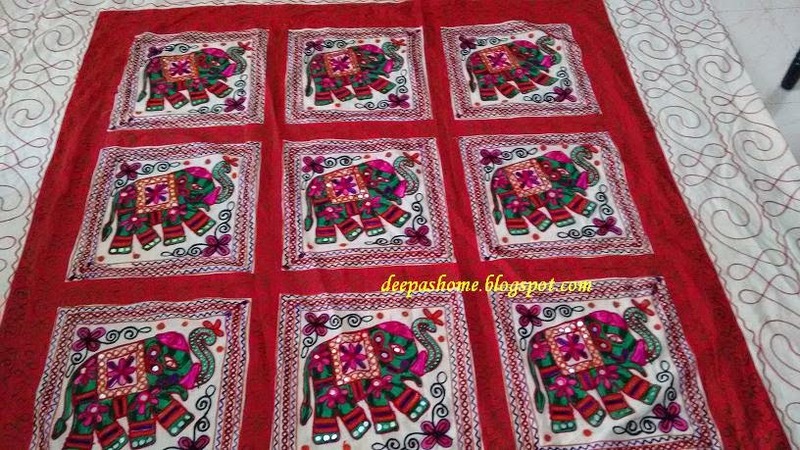 The whole sheet consists of 9 elephant motifs chain stitched with what is known as 'patla oon' (thin woolen thread). This is a type of thread I've been trying hard to obtain, but not yet succeeded. 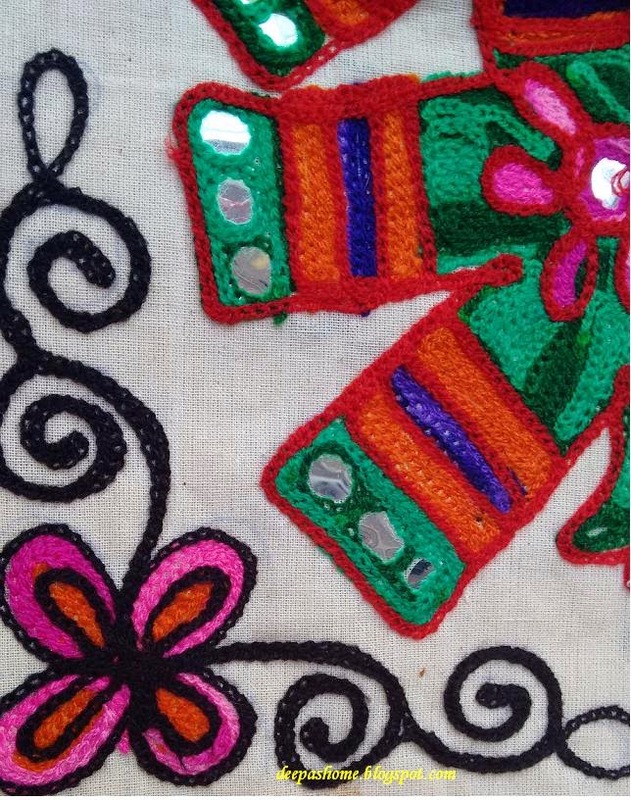 The entire piece is chain stitched with five different colors. Here is a close up.You can click on the pictures to enjoy a better view. The color combinations are really striking - Shades of green,pink, dark blue,red,orange and black. 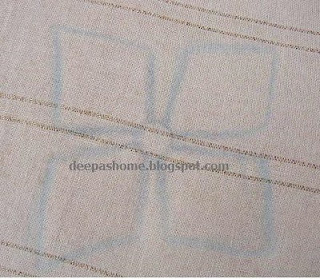 The reverse looks so neat and and the stitches are so even that it looks machine stitched.What do you think? Machine embroidered or hand embroidered, I love it !!! But it may take a while for me to get myself to sleep on it :) I hope you too enjoyed the colorful journey.. This is lovely! My embroidery never looks this neat at the backside, I think you're right to have doubts. no matter how it was done it's wonderful. enjoy it! Possibly done with an aari hook? If it were machine-embroidered, I'd expect to see a few loose ends on the back. 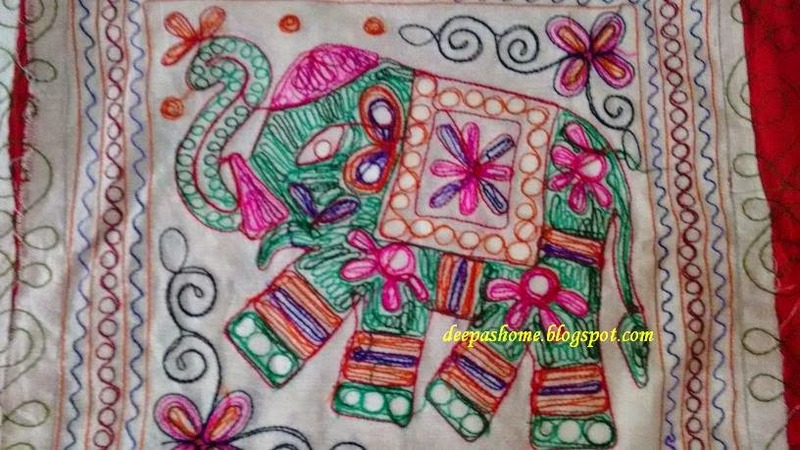 Hand-embroiderers are (in my experience) more likely to be careful about tying off loose ends, and there's been some awe-inspiring embroidery done with the aari hook, including European haute-couture (where it's called tambour embroidery). Either way, it's very lively and charming! I've seen this work, but never on the scale of your piece. It's amazing whether it's done by hand or by machine. I love the wonderful colours! Hi Deepa, I was really happy to see your message! I still love sewing but yeah I took a break from blogging...That's a lovely pic of yourself, glad to see you finally:) Wishing you a productive yet relaxing new year! Beautiful work, as usual. 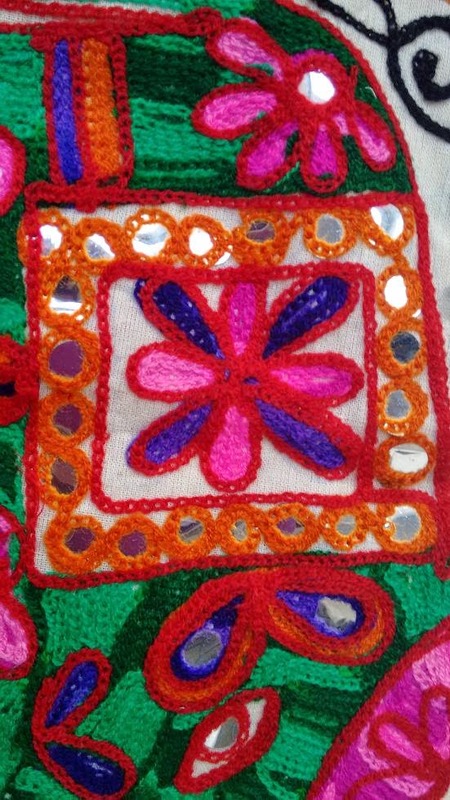 I have been following your blog since I came across it a few years ago, whilst searching for a Kutch Work tutorial. I have tried to replicate the design you did, and have linked you in my blog. I would love for you to check it out and let me know what you think. I agree with magpiestitcher - worked with a hook. I teach tambour at the Royal School of Needlework in London. Tambour is a chain stitch worked liked crochet through fabric. The back looks like machine stitching. I love the vibrant colours on your piece. I Want to share my crafting with u.